and i also wanted to make something to contribute to Rachel's Celebrate Color for Fall. i'll admit, fall colors are a bit of a stretch for me. i just made a little rule for myself. EVERY piece came from my scrap pile. i just pulled out any scrap, looked at it, decided if it looked 'fallish', and if it did, i added it. only one problem i must confess. 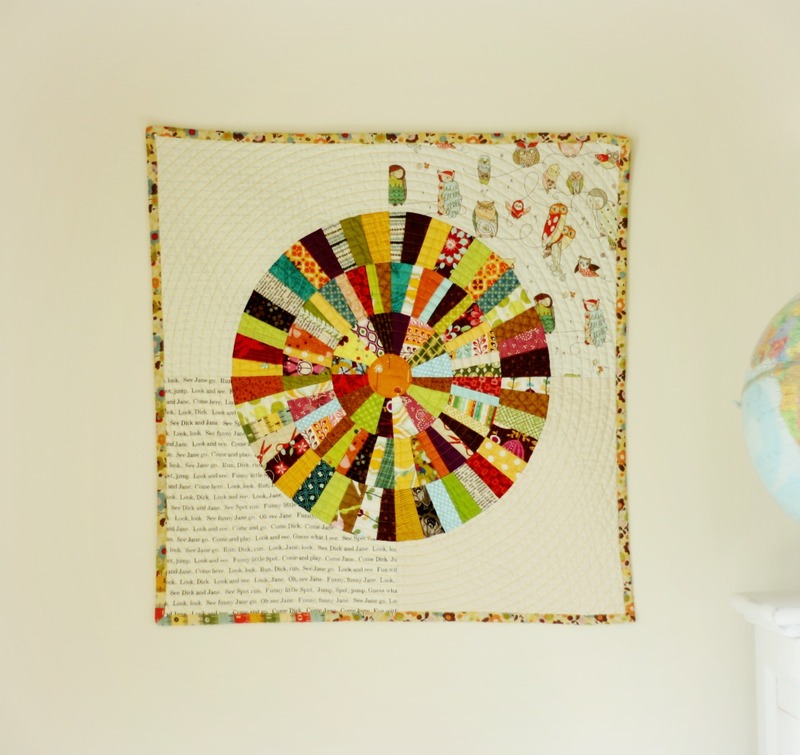 i went happily round and round, quilting in tiny circles, and in the end, this crazy thing will. not. lie. flat. i have to pin it tightly to the wall. next time i will alternate the direction i quilt the circles. lesson learned. I love that! 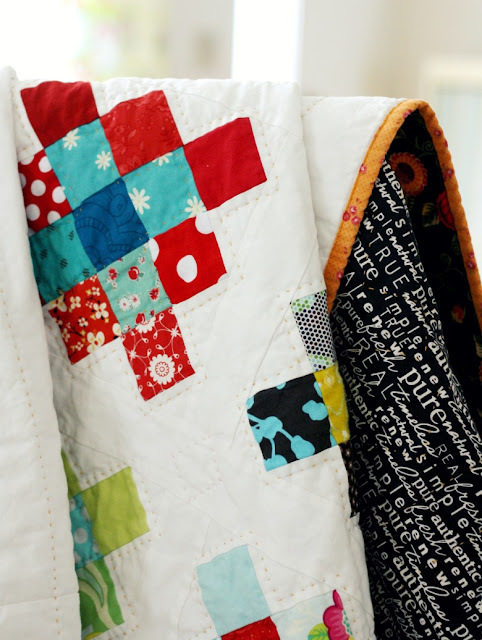 The quilting is really neat. Oh, I absolutely LOVE it. It looks gorgeous!! This is gorgeous! I think you have the home decor prize in the bag! I absolutely LOVE this - it is so original! And the contrasting fabrics in the 'white' area is so striking. Perfect. This is so, so, achingly gorgeous. It's beautiful! Have you tried blocking it to help it lie flat? Mind you, one of my wall hangings is nailed to the wall so maybe I need to take my own advice! This piece is speciall! Lovely owles! A great piece of art--truly enjoying your blog and aesthetic! Stunning! I, too, really love the alternate fabrics in opposing corners. Just beautiful. Oh wow!!! Love it!! It's beautiful!!!! Wow! Wow!! And thrice WOW!!! It's totally gorgeous.... wish it were mine! Oh MY Goodness. This is completely, spectacular. WOW. Jolene, you amaze me! Completely perfect. I absolutely love it. who cares about lying flat - this is scrummy! yes, I agree with the above comments. beautiful, amazing and I, too, love it! Thank you for continuing to share your work. I just love it! The circle colors with the text and owl fabrics in the opposite corners. Nice! This is absolutely gorgeous. I definitely think the colors say "fall"! Wow, me too, I've wanted to make one as well. Love the colors and the word fabrics! Your colors are definitely fallish! Love the prints you used in the two corners! I have been contemplating quilting one of my quilts in concentric circles. I am hesitant about doing it by machine. I've never done it before. Was this your first time? It looks great. So beautiful! I love it!!!! WOW! It is so amazing. I love it. 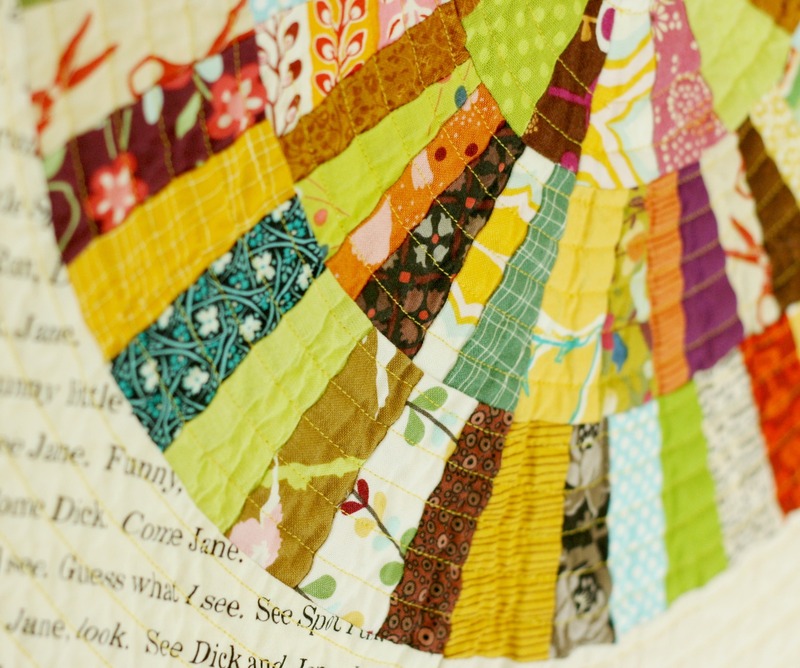 I love the colors, the scrappiness of it, your quilting. Great job! Really great! So beautiful! I love the background fabrics too. Where are the owls from? I seriously love this! I pinned it right away! Just seen that you won your Celebrate Colour category - congratulations! Congratulations on winning at the Celebrate Colour! I almost feel as if I won myself since I vote for your quilt. 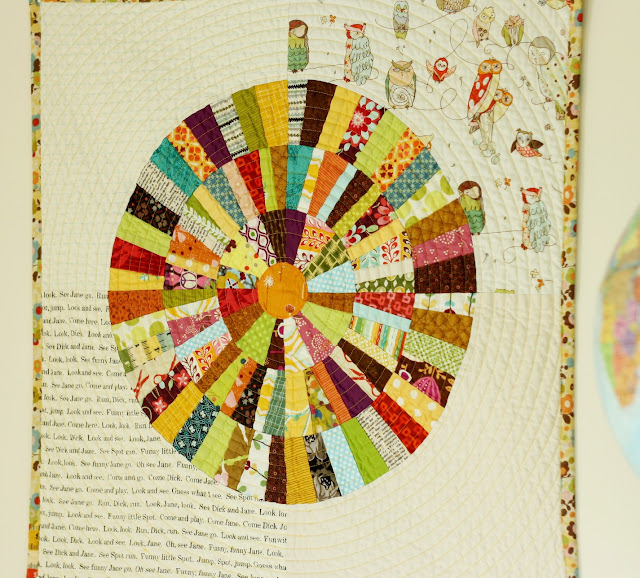 It is so lovely - the colours, the quilt lines and the fabrics you used for background - perfect. Definitely fall! Definitely amazing and well done! That is beautiful!! So artistic, I love it. I absolutely just love this! So beautiful & fall like! I love that owl fabric too! Can I ask what line that is (if you remember :)? Gorgeous! I am working on this same pattern, but using lots of my bright scraps. I haven't yet tried to sew the arcs together though. Yay! I just saw your quilt on SewMamaSew and wanted to see a closer view of it. I love it! Congrats on the recognition. hi Jolene! did you use a pattern for this? thank you! !